Components are manufactured from various premium grade materials: Aluminium – Stainless Steel – Brass – Aluminium Coated Mild Steel – Acetal. All machined components are produced in house by hi-tech CNC lathe and machining centre technology resulting in high tolerances and surface finishes. Inspections carried out at key times with every production process to ensure customers requirements and compliance with all current Standards and Regulations. 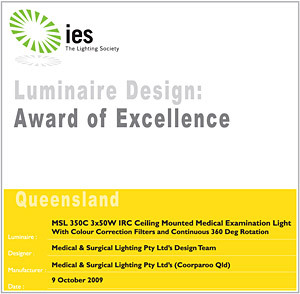 As a result of its design and build quality features the MSL Series 3 ceiling mount was the winner of the coveted Luminaire Design Award of Excellence at the 2009 Queensland IESANZ Design Awards and was also a finalist at the 2010 Australian IESANZ Awards.